Beach lovers and divers love staying at Hotel Bosque del Mar (literally translated it is Forest of the Sea). A small, boutique hotel, this charming 32 All-Suite property was built with its surroundings in mind and Howler monkeys hang out in huge trees near the pool and bar. This hidden gem sits right on the beach, so you are only steps from your room, the restaurant or the pool from the sand and lapping Pacific Ocean waves where beach lounge chairs await you and massages are offered. Just a short walk and you will find restaurants, a sports bar and a grocery store, plus it is close to Daniel Oduber International Airport (LIR) — only 25 mins away! As you walk to the beach from your room, Hotel Bosque del Mar appears like a wooden ship with angularly shaped wood beams and upper-deck bar. Lovely lush gardens filled with tropical plants and spectacular Pacific sunsets, make this idyllic setting a favorite of beach visitors. 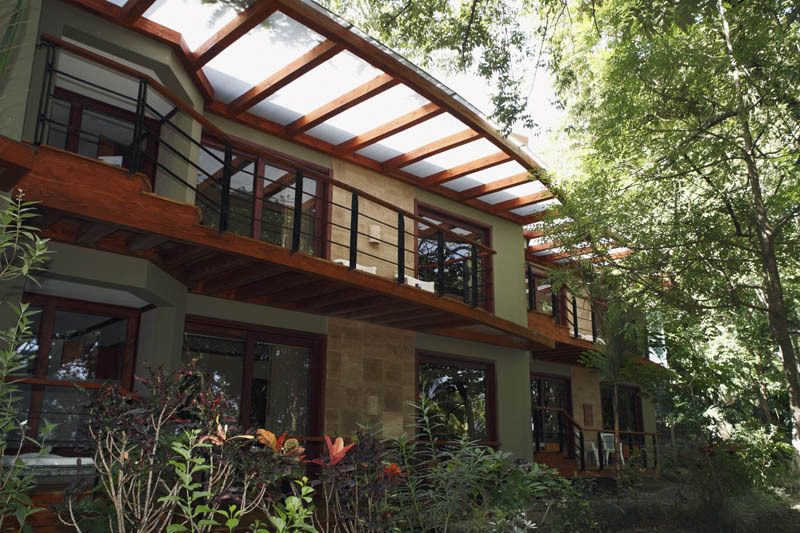 Located in Playa Hermosa, Guanacaste, Bosque del Mar is located directly on the beach. Each room has a seating area or living room and a patio or deck where you can enjoy the ocean breezes and hear the birds and monkeys. The hotel’s restaurant and beach-front setting make it a hit with guests and local resident hosting many weddings, receptions and events. Bosque del Mar is an All-Suite hotel offering Junior Suites (20), Garden Suites (6) and Ocean Front Suites (6) with with comfortable bedding, a mini-refrigerator, Coffee maker with Costa Rican coffee, Microwave, Electronic Safe, Hair Dryer, built-in writing desk with chair. Each room and a living area with Cable TV, plus a patio or a deck. The Garden and Ocean suites also have a sofa bed in the seating area and a bedroom that can be closed off from it making this a great option for families. Jr. Suites and Garden Suites have two Queen beds and rooms with two Queen beds or a King bed option is available upon request in the Ocean Front Suite only. Ocean Front Suites have a private Jacuzzi on the Patio or Deck. Free Parking (Self-Parking), Swimming Pool, Free High-speed Internet, Laundry Service, Restaurant and Bar. Kayaks available for rent. The Niromi Restaurant (6:30 am -10:00 pm) offers a choice of a breakfast buffet or a selection of freshly prepared ala carte menu items. For Lunch and Dinner, the menu features a wide variety of international dishes with to meet the needs of families or those needing vegetarian or gluten free options. Upstairs from the restaurant is the Lounge Bar Nya (2 pm -10 pm) serving tasty cocktails, local beers and wine.